It’s now spring. Here’s what to do when you see water pools emerge in your yard. University of Maine PhD student Jared Homola counting amphibian egg masses in a vernal pool in Lovell, Maine. As winter thaws into spring, Mainers may notice miniature marshes cropping up in their backyards and beyond. These short-lived swamps are known as vernal pools. The small, temporary wetlands appear in the spring when snow melt and precipitation fill shallow depressions in forested landscapes. The pools are usually dry by the end of the summer, but they play an essential role as a breeding ground for wood frogs, spotted salamanders and fairy shrimp. 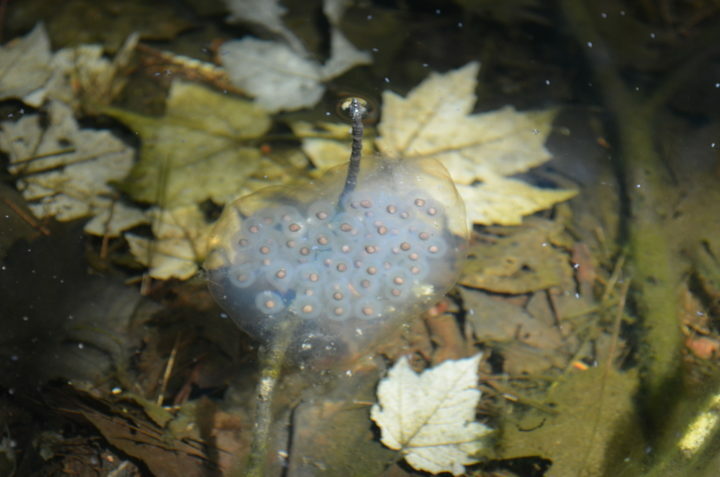 A spotted salamander egg mass deposited on a stick in a vernal pool in Lovell, Maine. Vernal pools are often found on private properties. It can be difficult to convince landowners to leave the stinky, stagnant puddles be instead of filling them, but a unique conservation policy, where town governments and private landowners are directly involved in protecting the features, hopes to change that. 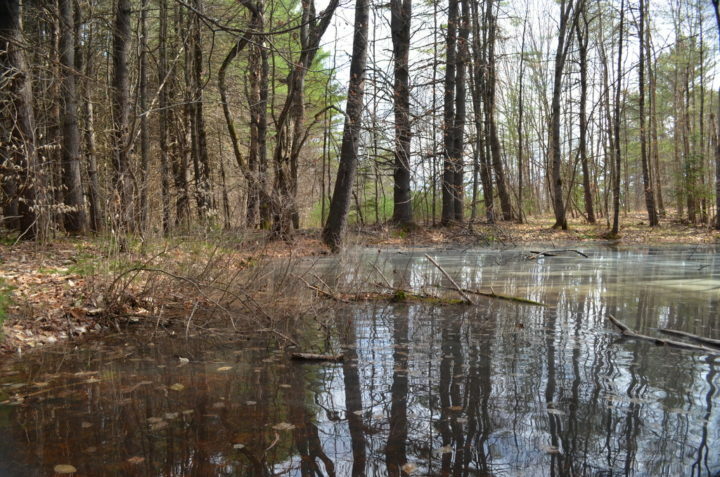 As the new method shows early promise, it could expand to address vernal pool conservation throughout the Northeast — and the preservation of other natural features around the world. 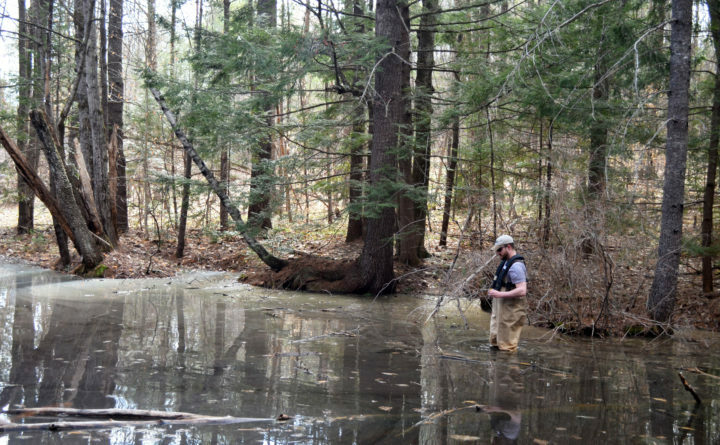 When Aram Calhoun, professor of wetlands ecology at the University of Maine, started researching vernal pool in the mid-’90s, she soon found that they were more than they seemed. According to Philip deMaynadier, wildlife biologist at the Maine Department of Inland Fisheries and Wildlife, half of Maine’s reptile and amphibian species use vernal pools to forage or take refuge. Endangered and threatened species such as blanding’s turtle and the ringed boghaunter dragonfly rely on vernal pools. Vernal pools also provide nutrition for a wide range of forest species, from tiny shrews to lumbering moose. Aside from the aesthetic challenge of vernal pools — which Calhoun said are often called “little muck holes” — many landowners do not know what vernal pools are. Calhoun launched the website Of Pools and People to direct landowners to information about vernal pools in an attempt to address these challenges. University of Maine PhD student Jared Homola examining recently collected amphibian larvae. Aside from the gap in public knowledge, deMaynadier said that vernal pools are hard to protect because they are small and they dry out. Conserving vernal pools also requires protecting land beyond the pools themselves. After amphibians lay their egg masses and leave the pool, they can roam a mile or more away to hibernate. “Putting a circle around them doesn’t protect their landscape-scale functions,” Calhoun said. Vernal pools are protected under Maine’s Natural Resources Protection Act (NRPA), but only vernal pools that are considered “significant,” defined as those that contain a large number of egg masses or support an endangered or threatened species, are protected under the NRPA. Calhoun was grateful for the existing regulations but saw room for improvement. Besides the fact that only a quarter of vernal pools were considered “significant,” Calhoun said the area of protection around the significant vernal pools as insufficient and the regulations gave landowners little incentive to report vernal pools on their property. 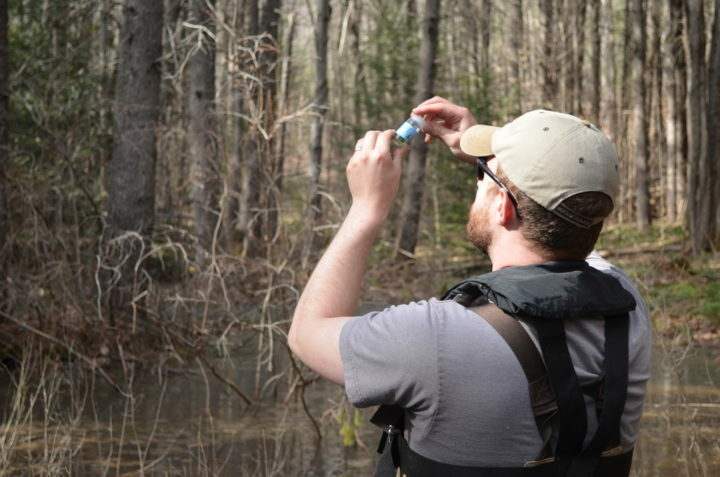 For years, Calhoun worked with scientists and researchers across disciplines to figure out how to fill the gaps in vernal pool conservation. Jessica Jansujwicz, now a research assistant professor at the University of Maine, researched vernal pools as a graduate student. Jansujwicz said that many of the landowners had a “positive perspective” about vernal pools for the wildlife they attract and the educational opportunities they provide for kids. Other landowners filled in vernal pools on their properties, either inadvertently or intentionally to avoid mosquitoes and the stench from stagnant water. A vernal pool in Lovell, Maine. “A lot of the benefits don’t come obvious to landowners,” Jansujwicz said. Jansujwicz also noticed that some landowners were skeptical of the existing regulations. To bring the conservation of vernal pools closer to the people, Calhoun’s researchers collaborated with a wide variety of agencies and organizations to develop the Special Resource Area Management Plan, or SAMP, for vernal pools in 2016. In addition to increasing the buffer around protected vernal pools and allowing local land trusts to assume their stewardship, the SAMP delegates the authority to regulate vernal pools to town governments instead of the Maine Department of Environmental Protection. The town of Topsham has already begun implementing the policy, while the town of Orono is still awaiting final approval from the DEP. The local government can decide whether to allow developments near vernal pools in exchange for a fee, which goes toward protecting rural landscapes. Richert said that in the past, developments in Orono have been halted when the presence of nearby vernal pools caught developers unaware. The local government also evaluates vernal pools on private properties, and landowners can volunteer to protect pools in exchange for compensation. Richert is optimistic that Orono will receive approval for the SAMP after their early April hearing. Most vernal pools in Maine are still protected through the NRPA and the effectiveness of the SAMP in Topsham and Orono remains to be seen, but Calhoun said there is already interest in implementing the policy in other Maine towns and throughout New England. Calhoun sees the potential of using the SAMP for landowner-friendly conservation in other rural areas in Maine as well.